Last Sunday, 23 May, an email exchange came out on the list of Ron Saba, editor of Montreal Planet magazine, an advocate of human rights, with an indefatigable focus on Palestinian rights. In particular, he unceasingly documents the full blown racism of the Jewish National Fund (JNF; which allows the sale of land in Israel only to Jews) and the overt complicity of the Canadian government and all its main political parties in support of Jewish racism against non-Jews. Saba emailed to his list (email: ac.nortoedivnull@etinamuh) a Carlos Latuff cartoon depicting Israeli apartheid. Weizfeld — who moderates the Jewish People’s Liberation Organization: Against Zionism and anti-Jewish racism (email: eman.sukofnull@ahalaas) — urges peace between Jews and Palestinians. Peace without social justice, however, is illusory. No, it’s not a matter of ‘Jews Only’ but a case of Zionists Only. There are Zionists who are not Jewish. There are Jewish people who are not Zionists and not permitted to enter ‘Israel’. And, there are Arabs who are Zionists. The conclusion one is drawn to is that everything one should not take everything the Zionist parties say as a given truth. The State of Israel is not a ‘Jewish State’, not even according to the founder of political Zionism, Herzl. Furthermore there is not such thing as Israeli Apartheid, it is actually Israel Apartheid, since it is State policy. It is time that the social critics also critique themselves. Weizfeld’s advocacy is simplistic and preponderantly oriented in favor of the oppressor. He denies the truth of the cartoon. He fallaciously attempts to argue a distinction between Zionists and Jews that would make Israel the Zionist State instead of the Jewish State. Undeniably, Christian Zionists (and Weizfeld’s Arab Zionists) would be hard pressed to feel equal in Israel; for example, gaining automatic residency and buying land from the JNF. Within the State of Israel, the characteristic used to determine rights is whether or not an Israeli citizen is Jewish or not. 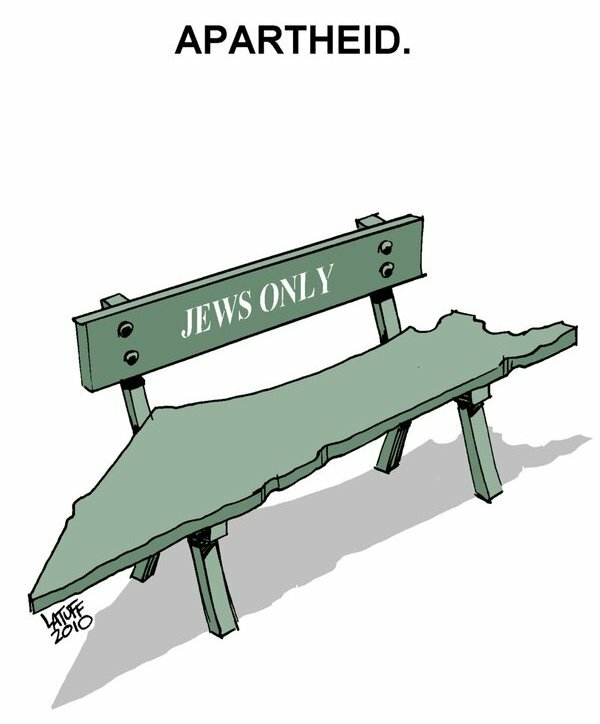 For example, the Jewish National Fund, which controls land in Israel on which 70% of the population lives, will only lease to Jewish Israelis, therefore discriminating on the basis of whether an Israeli citizen is Jewish or not (such discrimination done with the complicity of the Israeli State). This is totally analogous to pre-civil rights era Segregated United States and Apartheid South Africa where “Whites Only” was the defining characteristic for discrimination. And just as not all US or South African whites (nor for that matter elsewhere) supported “Whites Only” discrimination, that did not negate the fact that it was “Whites Only” discrimination. To say that Israeli Apartheid is based on “Jews Only” discrimination is not to say that all Jews support such discrimination, however no one can deny that the basis of such discrimination is whether an Israeli citizen is Jewish or not. When the world came together to oppose “Whites Only” Apartheid in South Africa, as a “White” I was not the least bit insulted by the use of the “Whites Only” label to describe such discrimination, since as a “White” I totally opposed discrimination by “Whites” or by anyone else for that matter. The discrimination in Israel is both State Policy AND the policy of institutions such as the Jewish National Fund whose bylaws enable and enforce “Jews Only” discrimination and whose funding and support comes from outside the State of Israel. Similarly other non state actors such as the Canadian Jewish Congress are full defenders both of the Apartheid State of Israel and of non-state institutions which enable and enforce “Jews Only” discrimination, such as the Jewish National Fund. That is why it is commendable and important that progressive and independent Jewish Groups such as yours continue to speak out to point out that not all Jews support institutions such as the Canadian Jewish Congress, despite the CJC’s (false) assertion that it speaks on behalf of Canadian Jews. However none of this negates the fact that ALL of us (including yourself) are criticizing “Jews Only” discrimination. Keep in mind, a Zionist who is not Jewish cannot lease property from the Jewish National Fund in Israel. This article was posted on Monday, May 24th, 2010 at 8:02am and is filed under Discrimination, Disinformation, Israel/Palestine, Propaganda, Racism, Zionism. If one evalautes a set of peoples consisting of 100+ethnicities as a PEOPLE and not as persons belonging to a cult or having some connection to other members of the cult, one can thereafter only lie! So, instead FOR JEWS ONLY one needs to say:FOR MEMBERS OF TALMUDIC CULT ONLY. I stop reading any post or writer after i come across the label “jewish people”. let us please acqnowledge the fact that we are a symbolic class of life. So, symbols shld stand for actualities; both outside our skins and inside our skins. Collateral damage, democracy, freedom, free press, free markets, terrorism, financial bailout, jewish people, american justice, self defence, secretary of defence and thousands of such symbols do have symbolic values [eristic in nature or reserved for clericy] but do not depict actualities or reality. These symbols stand for what goes on in their body-minds; so, don’t waste time trying to find out what exactly they think. Symbols like bread, kill, till, milk never change as long as as these things exist. They depict or stand for reality. Collaterally damaging people, stands for what? Only people who invented this false to fact symbol, know at a point in time what it means. To some of us collateral damage means not only killing people, but also murdering people in cold blood. All wars start with words. So the first thing war masters do is to wage war on our language and symbols. As some wise people have noted long ago: those who control symbols, rules u and no amount of revolution wld change that. There also must come a point where semantics gives way to the harsh realities of politics, aggressive wars, expropriation and occupation. Those on the sharp ends of the bayonets of the Jewish/Israeli/Zionist state are not quibbling over what to call their oppressors. Mr. Weizfeld need not be defensive. Let him continue his work of making distinctions, but let him also understand that the “Zionist” cause, in the eyes of most of the citizens of this planet, has now obfuscated and subsumed the “Jewish” or “Israeli” cause–they are all construed to be the same thing. Your comments regarding language, meaning, symbols (semantics and linguistics) are very interesting, and I appreciate the attention to such things. I have been reading a very interesting book along those lines, written in 1937, and it’s eerily relevant today. Title: Tyranny of Words Author: Stuart Chase. The devious nature of language has been the tool of all time. The book made me think of the poster here, bozh. Same concept bozh is always on with the words. . . glad to have had the exposure here in order to have a previous connection/bit of understanding with the book’s concepts of referent and confusion of word and thing. Interesting how the misuse of language can be so connected to sanity, or lack of. And such heady, high-order words can convince people to adopt principles that justify the slop that Israel heaps on humans. And the definitions and meanings slip and slide further from reality. . .
A new study conducted by Professor Daniel Bar-Tal (Tel Aviv University) have found out that an average Israeli prefer to live in ‘self-denial’ as he/she is not interested to know the facts about the Israel-Palestine conflict. They’re brainwashed with Zionist narrative of the conflict and hatred toward Arabs and Muslims from an early age. In an earliers survey (November 2007) the authors found out the Israel Hasbara (propaganda) lies’ effect on the Israeli Jewish population. For example 80.8 percent of Israel’s Jews agree with the statement, “Despite Israel’s desire for peace, the Arabs imposed war time and again.” In August 2008, 61% expressed at least some agreement with the view that throughout all the years of the conflict, Israel has been the victim, whereas the Arabs and the Palestinians are committing crimes. Furthermore, 77% thought Arabs and Palestinians do not place a high value on human life, and 79% agreed with the declaration that cheating has always characterized the Palestinians and the Arabs.